Everyone needs a little time for themselves to decompress and relax. Many homes at Shearwater are designed with spaces to retreat and find peace including private owner’s suites and spacious front porches. But when you want to get out of the house, Shearwater’s amenities provide a variety of options to treat yourself, from relaxing poolside to invigorating workouts. Spending time in nature is proven to not only relieve stress but also improve physical and mental health. Reduced blood pressure, heart rate and muscle tension are just a few of the ways a little fresh air can impact our overall wellbeing. At Shearwater, more than 12 miles of trails wind through our community, around peaceful ponds and along Trout Creek and 600 acres of preserved natural habitat. Imagine taking an evening stroll along your favorite path, enjoying the views and local wildlife as the warm summer breeze and babbling water carry your worries away. Meander down the trails to the Kayak Club for ample opportunities to relax and unwind. 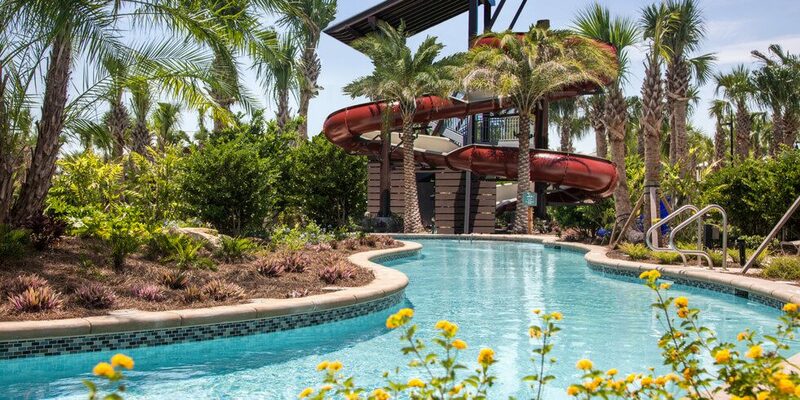 Grab a complimentary tube and hop into Lazy Bird River, the longest lazy river in Northeast Florida, anytime you need to escape. The lush landscaping makes you feel like you’re in a Caribbean paradise, without ever leaving the community. A few steps away is the resort-style Lagoon Pool, complete with shaded poolside lounge areas. Pick a spot under one of the umbrellas on a summer afternoon and take some time for yourself, while letting the kids play in the pool, right within sight. End your days cozied up next to the poolside fire pit listening to the crackling of the fire and good conversations. Exercise acts as a natural stress reliever, boosting your feel-good endorphins and improving your mood. Shearwater’s spacious Fitness Lodge is filled with state-of-the-art equipment. And no need to worry about leaving the kids home alone, because the Kids’ Room has plenty to keep them entertained right next door. Prefer downward dog to dumbbells? The Yoga Lawn is right outside, providing you with a peaceful space for your yoga sequences, from the warrior to the tree pose. Enjoy water more than land? The multi-lane Lap Pool will be your new escape, conveniently located at the Kayak Club. Is running more your speed? Choose between the innovative treadmills in the Fitness Lodge and the miles of trails throughout the community, whichever you prefer. Everyone’s oasis looks a little different. Find yours at Shearwater. Join our Founders Club to learn more about the amenities and lifestyle offered at this new community.